Politics. The only topic that is capable of creating division and heated debate among friends and families as much as professional sports. Especially in recent years, this sentiment has been aggravated by extreme political polarization, as exemplified by national elections in the USA, France, Brazil, or the Brexit referendum in the UK. Amidst this turmoil, I asked myself what is the role of scientists in political debates? Some scientists, including some of my former colleagues, believe in the separation of science and politics. For some of them, political debates should not have a place in scientific conversations. Some others do not oppose that discussion but are not interested themselves in the topic. It is interesting to observe some rejection to political engagement, in light of the fact that a significant portion of funding for research comes from government sources. Different governments have different policies concerning investment in education, science and technology that directly impact scientific research. It’s no secret that government funding is paramount to maintaining ongoing and future research, especially in basic sciences, where partnerships with private industries are relatively small. But beyond that, it is also important to understand the benefits of long-term investment in scientific research, in both basic and applied sciences, at a broader economic scale. Strong investment in research and development enables countries to develop new technologies and creative business enterprises to enhance their economic growth. This can be measured by indices such as the Global Innovation Index (GII). Some of the largest innovation clusters in the world, as identified by the GII, include the Silicon Valley in California and other major technology centres around the world, demonstrating how innovation is a key component for economic growth and diversified economies. Countries with a strong investment in research and development rank among the leaders in innovation on a global scale. Most of these countries have sustained proportionately high investments in science and education for many years (despite some occasional fluctuations), including Canada and the UK, for instance, demonstrating that their concern for research and development is not a recent venture. This continued investment in research pays off in the form of a relatively high number of students completing PhD programs and the high number of employment positions based on science and technology experts that those countries host. This research investment comes from two major fronts: government and industry. Most countries ranking among the top 25 in the GII have strong investments in research from both public and private sectors. However, public investment in research seems to play a special role in countries like the Netherlands, New Zealand and Norway, where business expenditure on research and development is quite modest compared to public investment, but still enabling those countries to rank among the most innovative in the world, with the Netherlands ranking second overall. Another important component from public investment in research and development is that most of the basic sciences depend on funding from public funding agencies. Although not usually recognized as an important component for economic development, some estimates indicate that between 60%-80% of papers published in basic sciences are linked to the development of patents on the mid-to long-term. This is one important aspect of basic sciences that is easily forgotten. For instance, who could predict that Einstein’s theory of relativity would play an important role in the proper functioning of GPS systems? Who could predict that studying ice cores in Antarctica would reveal the dramatic impact of human activity on global climate? Those examples highlight the mid to long-term benefits of investing in scientific research, which should be an incentive to countries or regions that currently lack or have reduced their investment on research and development. In such cases, keeping government-based investment on research to at least 2% of the GDP (close to the average of 2.3% for OECD countries) may provide the initial steps towards increasing innovativeness and the number of professionals with PhDs. Politicians can also help to boost business-based funding of research incentives to private enterprises, such as tax deductions towards investments in science and technology. 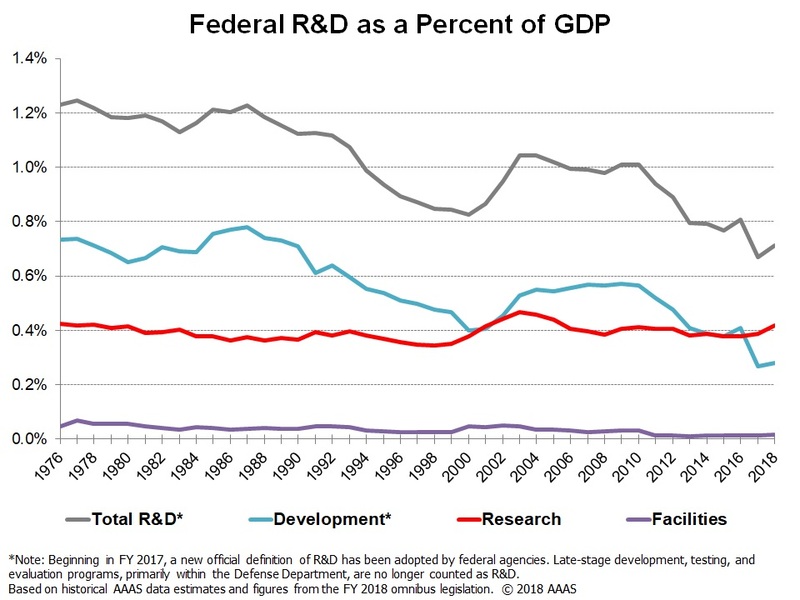 However, the recent reduction in resources to research and development observed in countries like the US or Brazil, despite the major long-term economic benefits of investment in scientific research, should serve as a warning. I believe that increasing public awareness on the relevance of scientific research to the expansion of human knowledge and economic growth is desperately needed. On this note, a greater engagement of scientists in politics could help changing this scenario, by engaging in science outreach, being active voices in their communities or even running for office. Some initiatives have already been taken towards the latter option, such as during the electoral process in the US. Some scientists in Brazil have also recently ran for office in this year’s national elections, especially motivated by the recent dramatic cuts to science and technology. In an era of increasing public misinformation, scientists play a fundamental role in promoting fact-based discussions and policymaking. I am a Postdoctoral Fellow in the Pierce Lab @ Dept. Organismic & Evolutionary Biology/Museum of Comparative Zoology, Harvard University. I work on the early evolution of squamates and on the phylogenetic relationships among squamates and other major reptile lineages. I started my career in my home city (Rio de Janeiro, Brazil), developing research on fossil reptiles at the Museu Nacional/UFRJ, and subsequently moved to Canada, where I obtained my PhD at the University of Alberta and expanded my expertise on phylogenetic methods, functional morphology and macroevolution. I am interested in combining data from living and extinct species, as well as morphological and molecular data, to explore and investigate deep time problems in vertebrate evolution. A great read – thanks for sharing your thoughts on this challenging topic!